Do you know those days that there's this one thing coming back to your mind every 10min?! I had that a few weeks ago. Since I woke up, I had this thing coming to my mind over and over again; spent the whole day thinking "I have to have it!!" and first thing I did when I got home was to grab the ingredients and off I was to the kitchen! I HAD to have Brownies. No chocolate bars, no chocolate cookies, no chocolate cake. No! It had to be brownies. Anyway; I browsed around for an easy but tasty recipe and I came across to the one I am about to share. Pre-heat oven to 180C and grease your baking tray. Heat up the honey until it becomes watery. I did it in the microwave for 20s. Add the cocoa powder and brown sugar to the honey and mix until smooth. In a medium bowl, whisk the flower, baking powder, baking soda and salt. Combine applesauce, coconut oil, egg and vanilla extract in a large bowl. Then add the cocoa mix and whisk until fully incorporated. Gradually add the flower mix to the wet ingredients and mix, but don't over do it! Pour in the batter in the baking tray and cook them for about 25min. I really enjoyed them! So fluffy and smooth. Just like I had in mind the whole day. Love the guilt level 0 at the bottom there, that's how it should be! Plus there's nothing better than when you're REALLY craving something and then you finally get it. 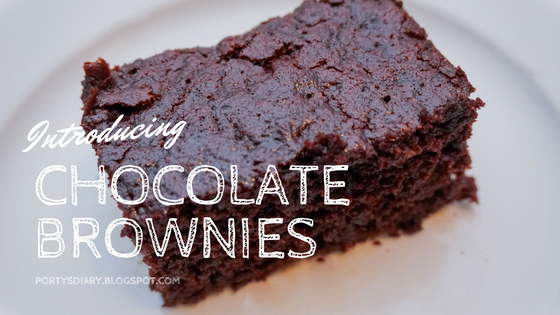 These brownies look really delicious as well!